On April 6, communication studies students and faculty connected through communication at the annual Comm Day event in Coleman Hall. The event featured 17 interactive panels throughout the day hosted by communication studies faculty as well as professionals in the field. The panels ranged in topic from assembling an effective demo reel to understanding how conspiracy theories are communicated to learning about programs available in the department. Comm Day began in the 1960s as a week filled with Rhetoric and Public Speaking activities. It was called “Speech Week,” as the department was then called Speech Communication and the events lasted for an entire week. Over the previous 50 years, both faculty and students have shaped the direction of this event into having its current balance between each concentration as well as between research and the applied. Each planner of Comm Day provides a different incarnation of the event. The 2016 planner, Associate Professor Dr. Angie Jacobs, promoted connection between all participants in every area of the event from the opening ceremonies that provided history on the event to a communal lunch with students and faculty to the inclusion of every area of the department into the event. At the end of the event, Dr. Jacobs hosted the closing ceremonies with a final round of prizes that were donated by local business. The department then honored office administrator Kim Turner for her years of service to the department. 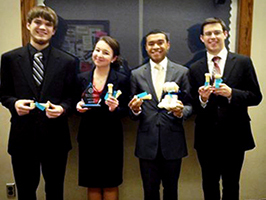 The Eastern Illinois University Speech Team traveled to Indianapolis, IN for two tournaments and had a very strong showing at the first tournaments of the 2014-2015 competition season. 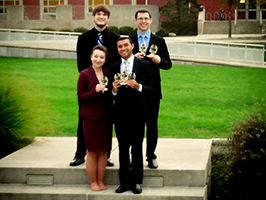 On Saturday, September 19th, the team competed at the Audrey Cunningham Forensics 500. Marques Brown, a junior Corporate Communication major from Bloomington, IL, placed third in Poetry Interpretation, fifth in Dramatic Interpretation, and third in Duo Interpretation with senior Psychology major Bethany Oxford, from Norris, IL. Sophomore Political Science major Austin Mejdrich from Charleston, IL, placed second in Impromptu Speaking, and sixth in Informative Speaking. On Sunday, September 20, at Butler University’s This Day in History Tournament, the team took third place in team sweepstakes, with every member of the team bringing home at least one award. Marques Brown was the Tournament Champion in Dramatic Interpretation. Marques Brown and Bethany Oxford placed second in Improvisational Duo. Bethany Oxford placed second in Prose Interpretation. Austin Mejdrich placed second in Impromptu Speaking, second in Informative Speaking, and second in Editorial Impromptu. Sophomore Tyler Kahanec, a Pre-Business Management Information Systems major from Spring Grove, IL, placed second in Dramatic Interpretation. The contest is named in memory of Betty Balasi, a long time staff member in the E.I.U. Department of Communication Studies. 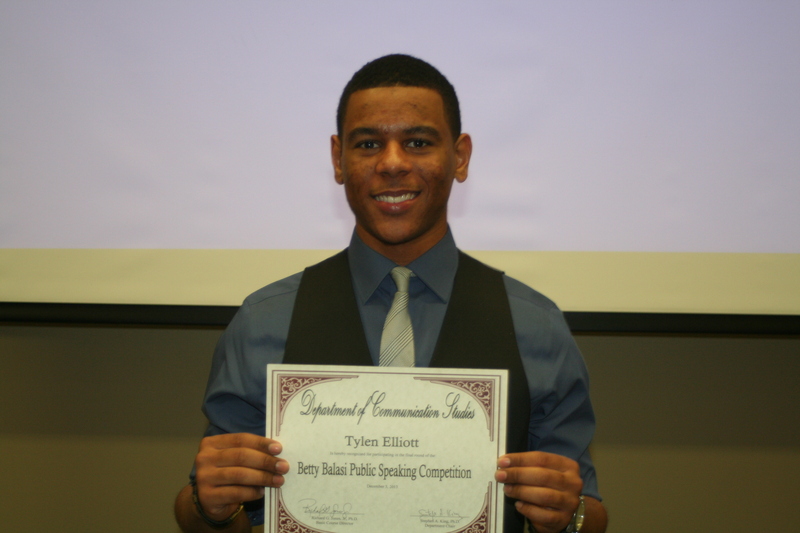 Twenty-two students competed in the preliminary round of the competition Monday night. 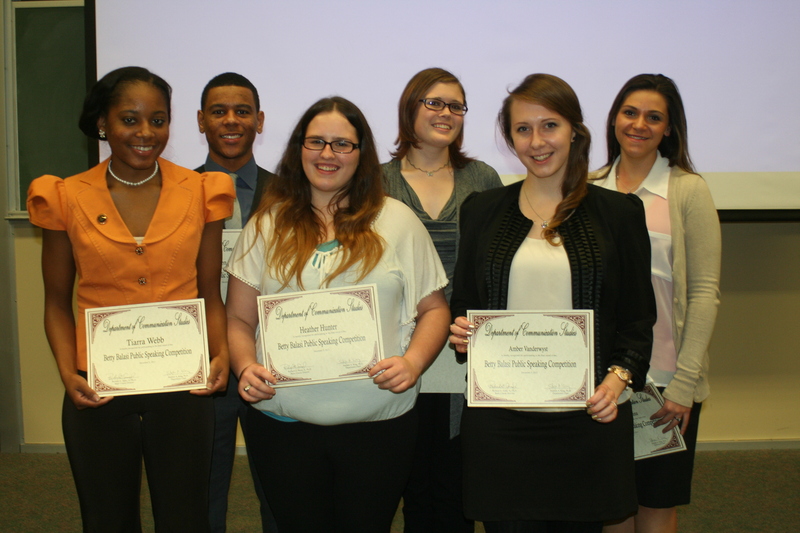 EIU CMN/Broadcasting Students Win Awards!